Cortal SQR, the pain reliever from Pharma-Rex Inc. that gives the safest and quickest relief from body pain through its advanced formulation of Ibuprofen and Paracetamol, recently held its running event, “Cortal SQR Run and Fly Away from Pain”. In support of the scholars of AMY Foundation, the participants were challenged to a 5k, 10k and 15k long trail along Roxas Boulevard which stretched the cities of Manila and Pasay. Aside from helping the student beneficiaries of AMY Foundation, the runners also got to chance to win two roundtrip tickets from Zest Air, one of the event partners, to prime destinations in the Philippines- Cebu, Puerto Princesa and Boracay via a raffle. Top finishers of the race per category also received cash and other prizes from Cortal SQR and its other event partners. The AMY Foundation is a non-stock, non-profit organization founded by Ambassador Alfredo Yao of the Zest-O Group of Companies. The Foundation aims to implement and sustain socio-economic programs in support of the development and advancement of the less privileged and less fortunate youth sectors of the society. “We acknowledge the help of Cortal SQR through this fun run to support our various academic programs for the youth.” said Ambassador Alfredo Yao. “With the support of companies such as Cortal SQR, we would be able to reach our goal of supporting our scholars and help them reach their goals and finish their studies.” Ambassador Yao adds. Attending business expos and events is one good way to find out what is the current trend of the industry and innovative products and services in store for the consumer in the future. Last May 12, the 4th Philippine Small and Medium Enterprises (SME) and Franchise Expo with the theme “Grow Your Business” was presented by Tradecon Inc. and Esquire Financing Inc. at the Philippine International Convention Center (PICC). For three days, it brought together various businesses and brands which included franchising, direct selling, retailing and networking. Randell Tiongson, business columnist and financial adviser, and Chinkee Tan, TV and radio host and wealth coach, gave motivational talks on how change in the Filipino mindset can help empower each one in attaining our financial goals. Esquire Financing, Inc. also presented its service, providing intelligent funding and strategic guidance with its principle that SMEs should never remain SME’s because every business has the brimming capacity to become large. One of the highlight of the event was the unveiling of the newest barbecue concept in town: YakitoriQ! YakitoriQ is the brainchild of entrepreneur-business consultant Mr. Jorge Noel Wieneke III, dubbed “Mr. KaAsenso” of PLDT, and known for his advocacy on entrepreneurial education for those who wish to put up their “mini negosyo” or have plans to expand their business. Mr. Wieneke was a former advertising guy and was responsible for putting up “Potato Corner,” the country’s first flavored French Fries brand that revolutionized the food cart business. He is also a founding member of the Association of Filipino Franchisers, Inc., one of the biggest franchise associations in the Philippines today, and teaches Applied Entrepreneurship at the Ateneo de Manila’s Center for Continuous Education (CCE). The company infuses a little modification on the popular yakitori food. Yakitori is a barbeque in Japan that even with the modification is still Japanese food--- on stick, on this case. For only P16 per stick, one can enjoy the real-meat YakitoriQ. One stick with rice is already fulfilling at P26 or you may want to taste the original or American version on two separate sticks with rice for P42. They also introduce chicken isaw, pork isaw and pork tenga in yakitori style. You can find YakitoriQ starting next month in Victory Mall, MCU, Greenhills shopping center, Tutuban Center, in Food Street, St. Francis Square and Robinson’s Ermita. The Philippine Normal University (PNU), the country’s National Center for Teacher Education, conducted a conference last May 7, 2012 billed as Teaching Powered by Technology: 21stCentury Skills and Tools for Teachers at the AV Theater of Edilberto P. Dagot Hall, PNU campus in Taft Avenue, Manila. This event is in collaboration with Vibe Technologies, the technology arm of Vibal Publishing House, Inc. The event is also in support of the Department of Education’s (DepEd) thrust towards the integration of Information and Communications Technology (ICT) in education. DepEd Secretary Bro. Armin Luistro has issued DepEd Advisory No. 212 s. 2012, calling for the participation of school administrators, supervisors, principals, school heads, coordinators and classroom teachers from both public and private schools all over the country. Among the speakers in the conference are Mr. Erico Habijan (Director, National Educators Association of the Philippines), Hal Plotkin (Senior Policy Adviser, US Department of Education), Michelle Casio (Education Lead, Microsoft Philippines), Fr. Johnny Go, S.J. (President, Xavier School) and Michael Xia (Regional Sales and Marketing Manager, McGraw Hill). Highlights of the event include the launch of Vibe Tablet, the first Philippine tablet specifically meant for school use, and the formal donation and turnover of the open courseware repository of the Massachusetts Institute of Technology (MIT), to the PNU for the use of their teachers and students. MIT is recognized as a leading engineering and technology university globally. In further collaboration, Vibal Publishing House, Inc. is donating a “classroom of the future” concept which will serve as the official home of the continuing year-long course with degree units at PNU. The facility will be equipped with mobile PC tablets, an interactive whiteboard and LCD projector. The project is also in line with PNU’s objective to enter into a twinning agreement with Columbia Universityʼs Center for Technology and School Change, which has a reputable international technology curriculum. Summer in the Philippines is definitely here. Why so? Temperatures ranging from 33 to almost 35 degrees Celsius have already been recorded—and even hotter days forecasted in the next few weeks. The sun’s ultra-violet (UV) rays have many effects on our bodies, the most common include “sunburn” or redness of the skin due to prolonged exposure, “tanning” or delayed pigmentation of the skin, or even “premature skin aging,” which often results to dryness, formation of wrinkles, sagging or loss of elasticity. Others include “eye damage,” especially if you’re a regular beach habitué, where UV rays reflect on the sand that causes UV rays exposure to increase. Of course, there is also “skin cancer,” where UV rays will help form damaging cells that will eat the healthy ones, and wherein a “cancerous” condition arises. But did you know that UV rays have damaging effects not only on our bodies but also on our homes, particularly our windows? Our windows allow us to see the world outside and therefore should also be protected from the harmful rays of the sun. They form part of our line of defense to protect our families from UV rays and therefore, should also be able to withstand it. The best way is to choose a window product that offers better UV protection for itself than anything else. This is where uPVC windows from Portal East come to the fore. Aside from its unique and innovative “Multi-point locking system” that makes the house secure and virtually burglar-proof and durable with its high-quality reinforced steel core, especially since most of us are out on our annual summer vacation, Portal East’s windows are manufactured to protect itself from warping or discoloration. They are really durable and do not warp in soaring temperatures, and doesn’t absorb the heat so the heat won’t be transferred into the house. “We’ve known for a fact that the Philippines, being a tropical country, is naturally exposed to the sun many times of the year. Our windows bear the brunt of absorbing UV rays to allow us to see outside our houses and should be protected also to make them last longer,” explains Ralph Tanco, Marketing Manager of Portal East, Inc., a leading manufacturer of uPVC doors and windows in the Philippines. 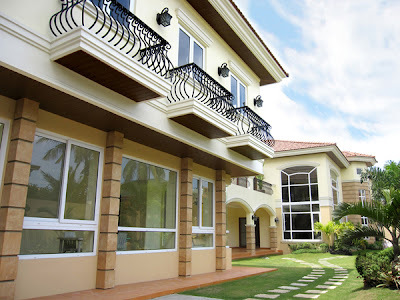 Portal East, Inc. is a pioneering creator, designer, tester, manufacturer and installer of quality uPVC windows and doors for new construction, remodeling and placement applications for both residential and even commercial edifices in the Philippines. An affiliate of the multi-billion dollar global chemical building materials corporation Shide Group of China, Portal East is renowned for its history of innovation, outstanding products, and impeccable quality customer service that delivers full customer satisfaction. To know more about Portal East products and how it can help protect your family and your home from harmful UV rays, call 242-2821/242-2721/245-5132, or 242-6906 (fax), email sales@portaleast.com or visit www.portaleast.com. Portal East main office is at 805-807 State Centre Building, 333 Juan Luna Street, Binondo, Manila, while the main plant is at NY Compound, 76 Bisalao Street, Bagbaguin, Caloocan City. Unilab ActiveHealth invites everyone to take part in advocating an active and healthy lifestyle by joining the second leg of the 2012 Run United on June 17, 2012 at Mall of Asia. Choose from any of the race categories and challenge each other to see how fast you can go. You can register your kids, aged 5 to 12 years old, in the Ceelin 500-meter dash, a perfect way to jumpstart their journey to fitness. You and older children can join the other race categories: 3km, 5km, 10km and 21km. Registered participants of 500-meter dash, 3km, 5km, and 10km will receive their singlet upon registration. The Active Health race belt bag, bib with timing chip, and Riovana 10% discount stub can be claimed during the 1st ever Run United race expo scheduled on June 13-16, 2012 at BGC Grounds near Mercato from 12nn to 8pm. The participants of the 21k category will have a different singlet color design which makes the runners extra special, aside from the freebies that they will get during the race expo in BGC and the 2nd piece of the collectible medal and finisher shirt. A personalized RunRio Timing Card will be exclusively given to them they just need to present their old IPICO timing chip during the registration to get the replacement. 21km runners will also get to enjoy running the Bonifacio Global City to Mall of Asia race route, giving them a chance to improve their PR for Run United 1. Shuttle service will be provided from MOA as pick-up point for 21km runners. “Active Health delivers Unilab’s vision of providing active health solutions for Filipino families,” Unilab Active Health Head Alex Panlilio said. “We encourage families to start or continue leading active lives through our events like Run United. As a testament to the level of commitment that Active Health brings to the runners, it has brought in the Team Bike Boutique, the official merchandise partner of Ironman races worldwide, to organize the Run United Race Expo happening on June 13-16, 2012 at the BGC Grounds near Mercato. The race expo completes the active health experience by gathering runners, sports enthusiasts and their families in this four-day event. Runners can hang out with their friends while checking out the coolest and latest sports apparel. Fitness and athletic brands also present their latest products and services, including gadgets, running gear, among others. 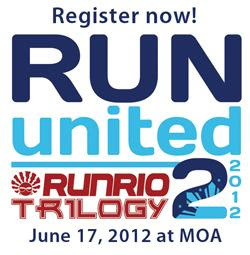 For online registration, check details at www.unilabactivehealth.com or www.runrio.com. Registration is until June 3, 2012 on a first come first serve basis. 2012 Run United 2 is for the benefit of Gawad Kalinga and Children’s Hour. For more inquiries, check out www.unilabactivehealth.com and www.facebook.com/unilabactivehealth.